Cavalry orderly awaiting orders. Image from the Library of Congress Prints & Photographs Online. I had long ago dismissed the idea that I had any relatives who fought in the Civil War. After all, my paternal grandfather was a first-generation American, born nearly 15 years after the war, in 1881. And on my maternal side, my mother arrived from England in 1946, after the end of World War II – no Civil War vets in her family! Instead, I focused on those who served in the British military, from my mother’s side. I often bypassed the databases and research articles about the Civil War because they held little significance to me. What I had not done, though, was to go beyond my direct ancestors and look at the collateral lines for uncles and cousins. The first inkling that there were indeed a few Civil War veterans in my family, came in a short biography of my father’s great-grandfather, Henry S. Roberts. His granddaughter Ruth married my grandfather, and the Roberts family had been in upstate New York at least as far back as the early 1800s. The biography included a statement about Henry’s wife, Hannah Beaumont Roberts: “Mrs. Roberts had two brothers in the Tenth Cavalry.” Aha! With the help of such Ancestry.com databases as New York Civil War Muster Abstracts, U.S. Civil War Soldier Records and Profiles, the Civil War Pension Index, and the 1890 Veterans Schedules, I was able to find information about my two great-great uncles who both served with the 10th New York Cavalry. I knew they had been injured, and that they had served in Company L. But to find out more, I got copies of their pension files from The U.S. National Archives and Records Administration (NARA). George Patinson Beaumont and his brother William’s pension files consisted of 106 pages and 55 pages, respectively. Within all of these pages are numerous treasures and nuggets of information – the sorts of things genealogists dream about. Because George’s file was the bigger of the two, I focused on him first. In this post and the one following, I’ll show you the kinds of things that can be found in a Civil War pension file, and share what happened to George (and no, I don’t know where his middle name of Patinson comes from yet). George P. Beaumont was born in Penn Yan, Yates County, New York on June 14, 1838. In the 1860 U.S. census, he was single and living in a boarding house in Penn Yann, working as a blacksmith. The war was just a little more than 1 year away. 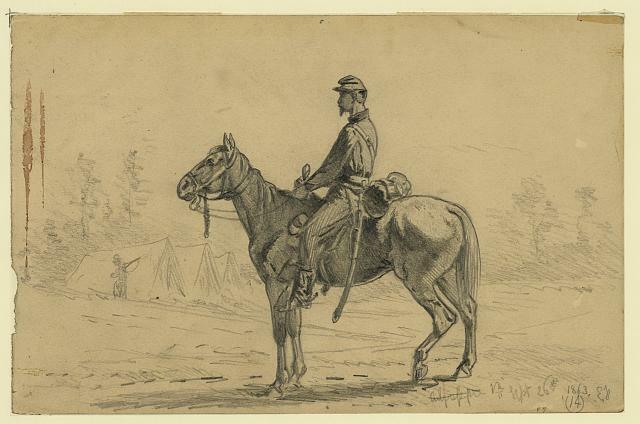 The 10th New York Cavalry regiment was formed in December 1861, and about a year later, added a third battalion. That’s when George joined. On October 29, 1862, at the age of 24, he mustered in to Company L of the New York 10th Cavalry Regiment, in Elmira, New York. According to Ken Morris’ Brief History of the 10th Cavalry, New York was the first state to supply volunteer cavalry regiments to the Union Army, in 1861. Although many of the recruits reportedly had little experience with horses, I expect that my uncle George was probably at an advantage due to his occupation as blacksmith! In my next posting, I will uncover what happened to George, and what I learned from his pension papers.